Think they’re all gone? Guess again! 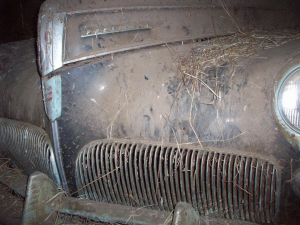 Do you think all the good Studebakers have been found? I’m here to prove you wrong. 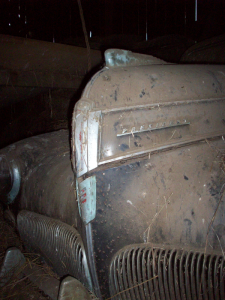 The 41 President 4-Dr sedan shown in the pictures attached has set in a barn for over 45 years. 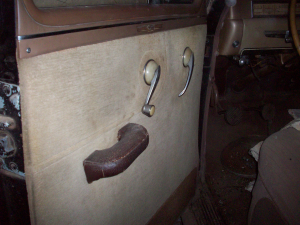 I’d known about this car for nearly a decade, but somehow, the party who owned it was never quite ready to sell it. I’d looked at it many years ago, and it was a pretty forlorn looking vehicle, with two wheels off and surrounded by loose straw. It looked to be a mess. Looks can be deceiving! 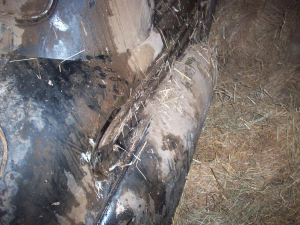 A few weeks ago, my son called me and told me he had received a call from the party who owned the car. They wanted to know if I was interested in the car. Naw….not hardly (lie!!!) 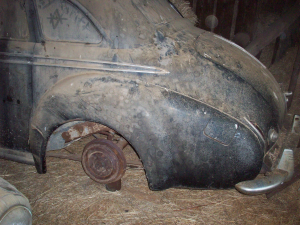 I could hardly contain my enthusiasm as I told my son to call her back and find out when we could look at the car. 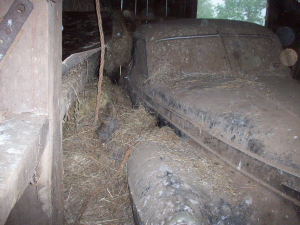 On a rain-soaked Sunday in July, we ventured to the barn where the car was stored. 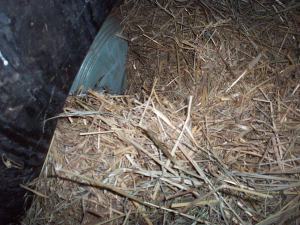 There it sat…..smiling at me…up to its bumpers in loose straw, and completely covered on one side with same. We opened the doors….looked inside and guess what? 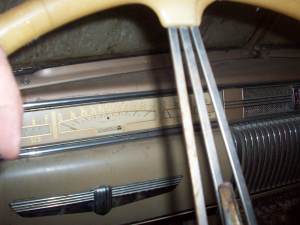 Factory clock, factory radio, deluxe horn ring….all the makings of a ’41 Studebaker President. “What are the miles on it?” I asked my son, Neil. He said, “you aren’t going to believe this….30,850.” At this point, the car had a new home…..I just had to make the deal. I met with the owner’s son, made him the offer and waited. She’s not going to take it….or she’ll change her mind. Oh well, I tried…. The 16th of July was a busy day as Cindy and I were preparing for a public sale of my mother and dad’s furnishings….and I see my son approaching with his truck, trailer and a vehicle on the back. Can this be the same vehicle I looked at?? 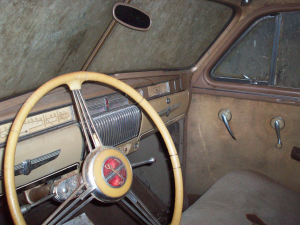 My son has washed the car….vacuumed the inside out….and it’s not only an original ’41 President…it’s a very solid ’41 President. 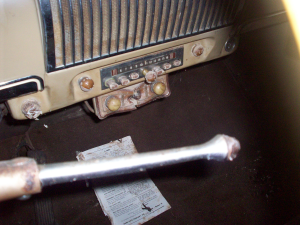 We’ve found only one rust through on the car in a very easy to fix spot. It’s solid….very solid. 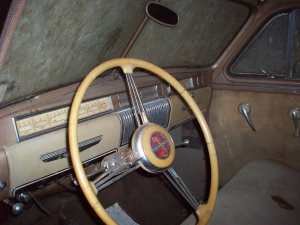 The original fan belt is on the car, and nothing appears to be missing. 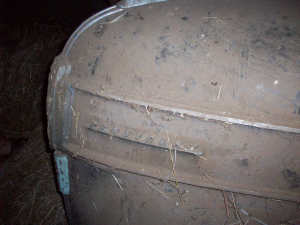 The tires, weather-checked and rotten-looking, still hold air. 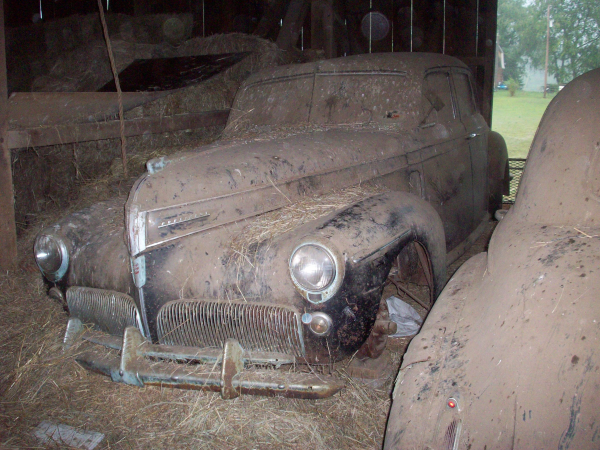 Take a look at the pictures….the cars are STILL out there….you just have to look a bit to find them.